Telecom giant MTN assigns $231m shareholder loan impacting its 2017 profits to African phone tower group, IHS Holding Ltd, to the give-back initiative tagged, ‘Season of Surprises,’ initiated by MTN to express appreciation to Nigerians which has ended, touching about 250,000 lives. Nigerians have in turn describing the initiative as a thoughtful and kind gesture by the Africa’s biggest mobile phone operator, MTN. The ‘Season of Surprises’ train passed through scores of states including Abuja where people in major shopping malls were handed vouchers from MTN to pay for their purchases. The story was the same in the ancient city of Benin. An ecstatic Stella Okogun, a trader, walked home with a brand new television set at the headquarters of Oredo Local Government Area, Benin City, where the ‘Season of Surprises’ train berthed. “MTN has surpassed my expectations. I am very grateful and I appreciate them for this wonderful gift. I can’t believe I am going home with this television. I can’t remember getting a gift as big as this since I was born,” she declared. The initiative ran over the course of two weeks across 32 states and the Federal Capital Territory, reaching 263,893 people with several gift items. 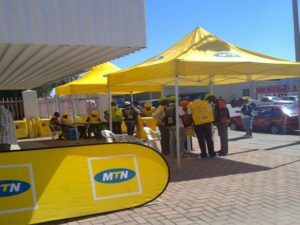 According to MTN, which returned to profit in the first half of its financial year in the absence of one-off charges related to a $1.1 billion Nigerian fine, said the assignment of the loan to IHS will lead to a loss of 2.8 billion rand ($228 million) on transfer of the carrying value of the loan. The telecommunications firm, told Reuters, in a statement, yesterday, in Johannesburg, that the loss on transfer will impact headline earnings per share (HEPS) for 2017, the main profit measure in South Africa that strips out certain one-off items, but not earnings before interest, tax, depreciation and amortisation (EBITDA). According to the telecommunications firm, MTN said the loan, which is due in 2024/2025, will allow its Nigerian unit to continue to invest in its network and simplify MTN’s interests in IHS.